These are new PCB layouts done using original Buchla schematics. I have substituted modern equivalents of obsolete transistors when necessary. No other changes were made, except for the "known" errors in some of the schematic drawings. I am also doing panels for each pcb. Panel files will be in .fpd format. The pcbs use 16mm pcb-mounted potentiometers in order to facilitate wiring. BOM and Mouser cart will also be available for each module. Luckily, there are no exceedingly rare parts used in any of the layouts to date, and almost everything is included in the Mouser carts (not the potentiometers). EDIT: Panel files are available via Dropbox. I am not yet sure how I will go about sharing the panel files. My web host does not allow .fpd files to be linked to, so if anyone has any suggestions, please. Ideally, I would just leave the panel files up for anyone to use. Would a github space be ok for hosting files? I will link the panel files to dropbox. Seems to work. Any problems, let me know. Have you a rough price for the 158 PCB? I always wanted a pink 100 series, and now I can do it! All 1u pcbs will be between 40€ and 60€. 2u stuff will be around 90€. The prices should be on the individual pages. Shipping is included. Will you be doing the full range? After these first 9, I will work on 144, 123, 107, 114, 175, 190. Not necessarily in that order, though. Hmm... Blue-chla 100 system... Sounds like fun. Any exotic parts needed to build these - weird transistors, etc.? not yet! And mostly everything is available from Mouser. Very cool! Any thoughts on doing the Buchla 148 (Harmonic generator)? Also- do these run on 15v/0v, or is there a 24v line required as well? Everything so far is +15v/0v. +24v is needed for the 190, but that will come later. How hard would that be to adapt it to Serge specs/voltages ? Hopefully just a few components that would need to be changed for 1V/oct tracking and +/-12V supply ? I guess it's a bit more than that as Buchla audio is at line level and the CV doesn't like negative V's IIRC... What do you think lasesentaysiete? Is that true on the 100 too? yes, line level for audio. CV range is different, too. Some of the 100 circuits produce and/or expect a 0-15v range. 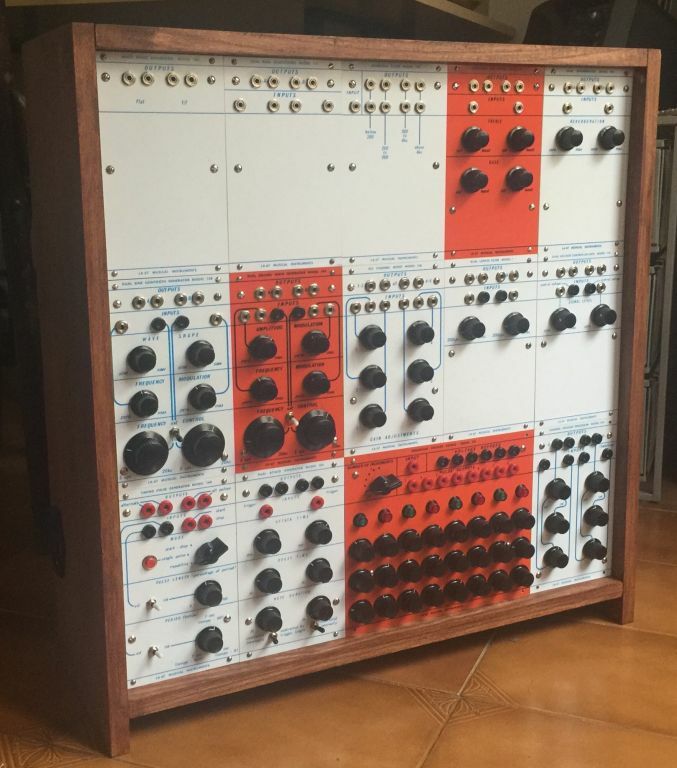 For a Buchla osc in Serge, I would go for the 258J from J3rk. The original circuits involve a fair bit of fun with biasing because of the single supply arrangement, so it wouldn't really make too much sense to make simple adaptations for a dual supply -- you'd want to redo the biasing too. At this point you are out of clone territory and into homage. No bad thing, but a different thing. I know this is off-topic, but black panels were exactly what i was considering whilst walking our hounds today! I am starting to get a fair few of the buchla panel designs sorted, and was wondering if there would be a market for black panels in that format, rather than just the usual blue and silver. I'm not feeling that confident enough with pure analog electronics, unfortunately. 1. Would a pcb/panel option be preferable to just the pcb? 2. White or silver panels? Or the option to choose? I know some of you have already answered indirectly, but the possibility of offering the pcb/panel combo exists. I am just trying to see if it is worthwhile, in general. I would be up for PCB+Panels, white or silver both good options.